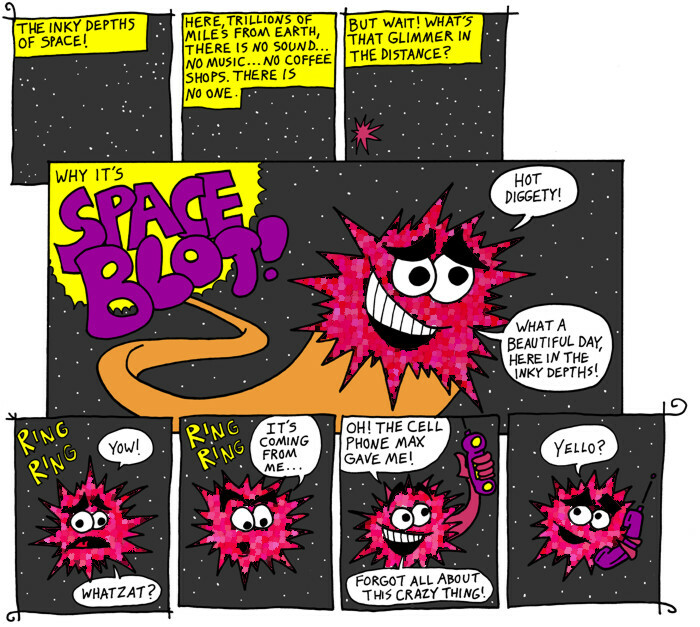 Fuzzball & Scuzzball - SPACE BLOT! Comic 145 - SPACE BLOT! I made up Space Blot when I was in 5th grade. He's always been one of my favorites. Originally, as we saw a few episodes ago, Space Blot was yellow. I thought he looked too much like electricity, though, and not enough like a blot. I tried different designs and I wasn't happy with any of them, so I kept his shape basically the same and changed the color. At this point my loving wife was doing the coloring, and she enjoyed experimenting with different effects. In an effort to make the character more blot-like, she did the weird distortion thing, which I liked at first but dropped for his subsequent appearances.